What’s in a name - Australian Royals? In 1963, the name of Australia's new decimal currency was announced. Prime Minister Robert Menzies was bringing in the Royal. Investigate the controversy surrounding the naming of Australia's new money. Resources include government media release transcripts, a cartoon, and an article written by a Museum of Australian Democracy curator. Would you choose Royals or Dollars ? Which event in Australian history does this cartoon refer to - do you recognise any of the people or symbols? Find out some of the other suggestions for the name of the new Australian currency. Why do you think the Royal was unpopular, and the Dollar was chosen instead? Explain what this decision tells us about political views in Australia at the time. Imagine it is 1963 and you are in charge of changing Australia’s currency. What name and images would you use? Support your opinion with evidence relating to the political and social context of the time. Consider changes over time – if you were responsible for introducing a new currency today, would the public debate be similar or different? Do you think we will need a physical currency in the future, or will digital currency take its place? Make a short digital film which highlights differing opinions about the introduction of the Royal in 1963. You could make your movie as a news report, or in a ‘vox pop’ or ‘Horrible Histories’ style format. 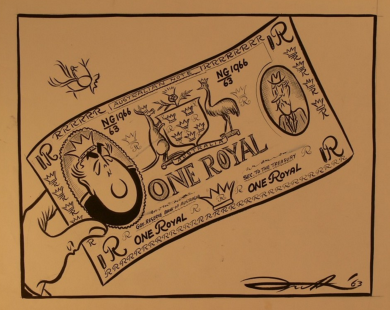 Draw, or use digital media, to design your own Australian currency – from the 1960s, today or the future. Consider its name, the units of the currency and design features of the different denominations. Be inspired by the Dollar Bill advertising jingle made in 1966, and create your own jingle to promote your new currency.